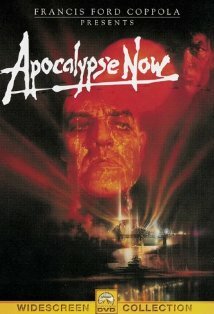 There is a reason why Apocalypse Now is on a number of top movie lists of all time - it is just that good. Thanks to Netflix, I got a chance to relive the three plus hour redux version. And it is as gripping, raw and dramatic as I had remembered it to be. The story of Apocalypse Now can be summarized into a sentence - a captain is asked to go upriver into Cambodia, during the Vietnam war, to kill a Colonel who had gone rogue and was operating outside the bounds of human decency. The rest of the movie is an exploration of the psyche of war, and the damage it wrought on the minds of men and women involved in the conflict. It is a manifestation of the insanity of battle, the ambiguity of its morals, and a quest into the very definition of victory. The cinematography is psychedelic, filled with blues, pinks, purples and greens. The days are filmed in flat monotones, and the nights in unmitigated bright splendor. The indoors are a constantly moving play of dappled light, while almost all outdoors shots include fog - the fog of war. The music swings lazily from the classic Ride of the Valkyries to what can only be described as trippy bell crescendos. The movie, especially the redux version, does not care about time. The scenes are elaborate, fading in and out of each other, never clean or clipped. The dialogue and voice over, ties it all together - recurrent, almost poetic in places - all the while driving relentlessly amidst the chaotic visual imagery. The movie has some of the most memorable scenes of modern cinema. The iconic scene of napalm bombing of a countryside with The End from The Doors playing in the background sets the mood for the entire movie. Then there is the attack by the helicopter gunships playing The Ride of the Valkyries. And of course there is the scene that has been parodied so many times since - "The horror, the horror". Marlon Brando plays Colonel Walter E. Kurtz, the errant colonel. Martin Sheen is the loner Captain Benjamin L. Willard, sent to end the Colonel's command with extreme prejudice. Robert Duvall is Lieutenant Colonel Bill Kilgore, the surfing-crazy commander. A very young Harrison Ford and Lawrence Fishburne also star in the movie. If this is the first time you are watching the movie, I'd suggest the regular as opposed to the redux version. There are a number of scenes that add a lot of depth to the story, but may end up being too heavy for a first timer.